I can't believe this happened to us. We always have close calls. No one dies like this. This is the second time someone dies this year; it's extremely dangerous. 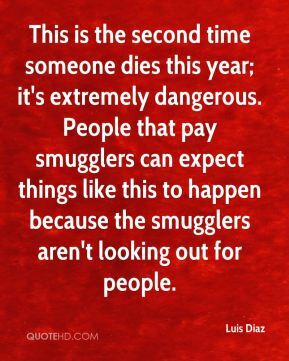 People that pay smugglers can expect things like this to happen because the smugglers aren't looking out for people. 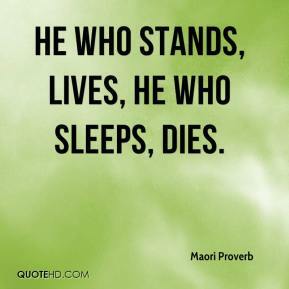 He who stands, lives, he who sleeps, dies. 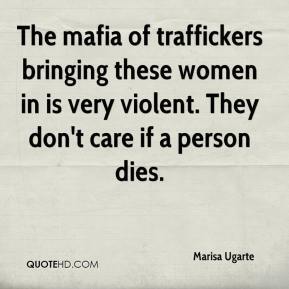 The mafia of traffickers bringing these women in is very violent. They don't care if a person dies. 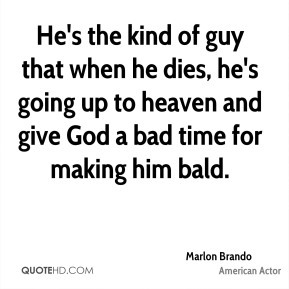 He's the kind of guy that when he dies, he's going up to heaven and give God a bad time for making him bald. 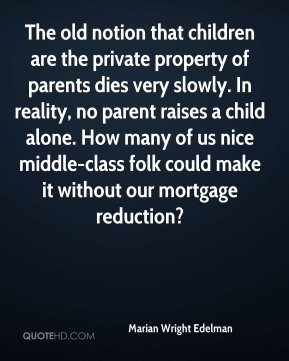 The old notion that children are the private property of parents dies very slowly. In reality, no parent raises a child alone. How many of us nice middle-class folk could make it without our mortgage reduction? 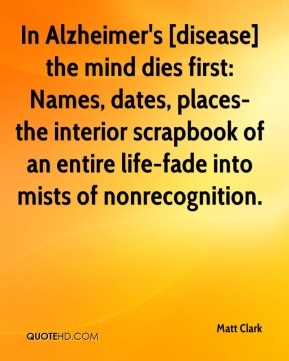 In Alzheimer's [disease] the mind dies first: Names, dates, places-the interior scrapbook of an entire life-fade into mists of nonrecognition. 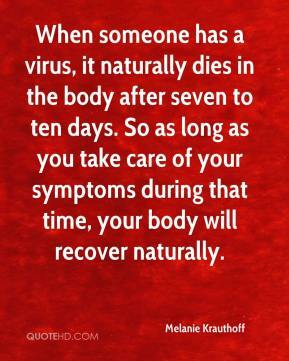 When someone has a virus, it naturally dies in the body after seven to ten days. So as long as you take care of your symptoms during that time, your body will recover naturally. 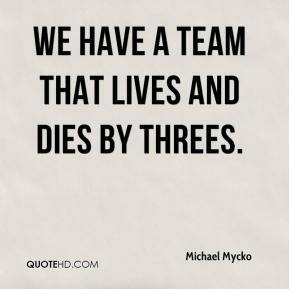 We have a team that lives and dies by threes. 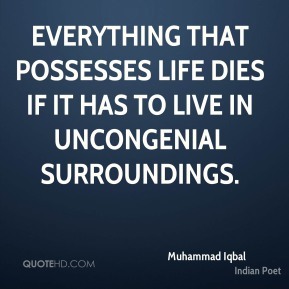 Everything that possesses life dies if it has to live in uncongenial surroundings. 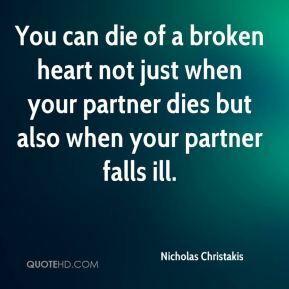 You can die of a broken heart not just when your partner dies but also when your partner falls ill.
We showed you can die of a broken heart not just when your partner dies, but when your partner falls ill. We showed it is not just death that can give you a broken heart, but illness -- even when the spouses don't die. 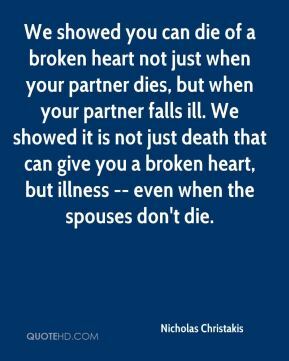 You can save my life by taking better care of my spouse as she dies. 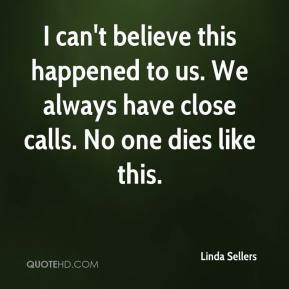 People care about the burden of their death on their loved ones. 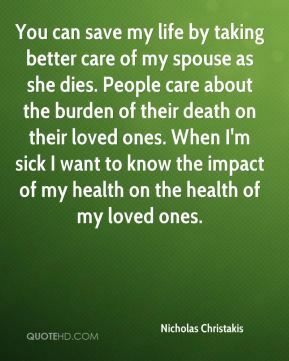 When I'm sick I want to know the impact of my health on the health of my loved ones. 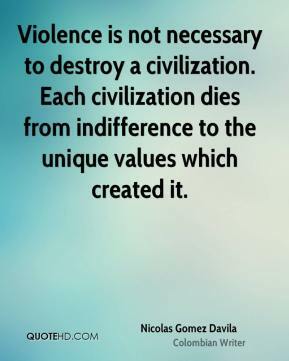 Violence is not necessary to destroy a civilization. 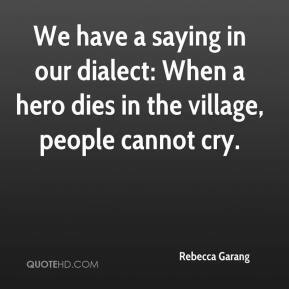 Each civilization dies from indifference to the unique values which created it. 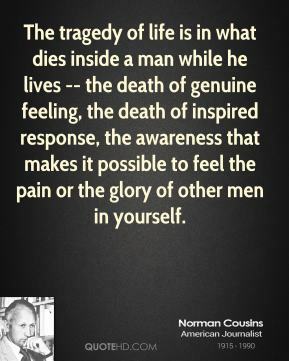 The tragedy of life is in what dies inside a man while he lives -- the death of genuine feeling, the death of inspired response, the awareness that makes it possible to feel the pain or the glory of other men in yourself. One of them is sick, badly sick, and could give up tonight. 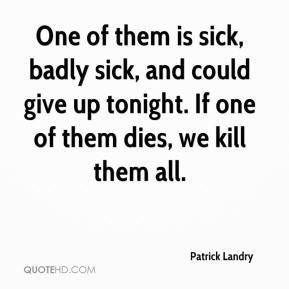 If one of them dies, we kill them all. 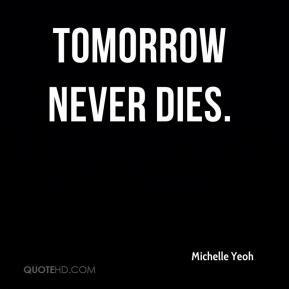 Once a great wrong has been done, it never dies. People speak the words of peace, but their hearts do not forgive. 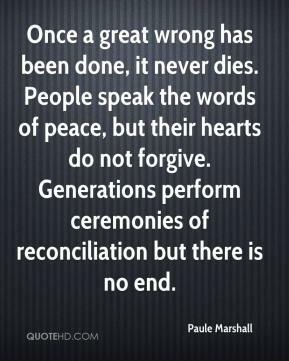 Generations perform ceremonies of reconciliation but there is no end. 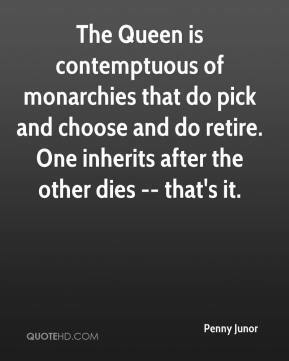 The Queen is contemptuous of monarchies that do pick and choose and do retire. 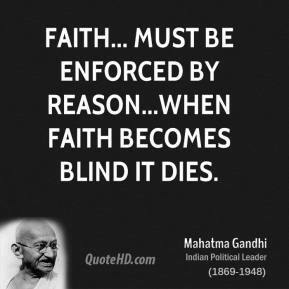 One inherits after the other dies -- that's it. 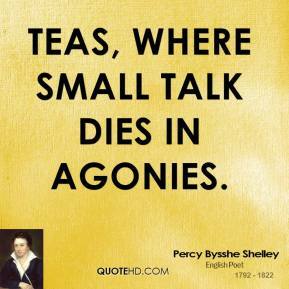 Teas, Where small talk dies in agonies. We've finished making unilateral, painful concessions. After the euphoria dies, the Palestinians will have to get down to taking real steps to show that they can stop terrorist activity. 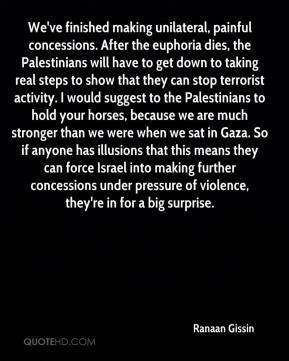 I would suggest to the Palestinians to hold your horses, because we are much stronger than we were when we sat in Gaza. So if anyone has illusions that this means they can force Israel into making further concessions under pressure of violence, they're in for a big surprise. 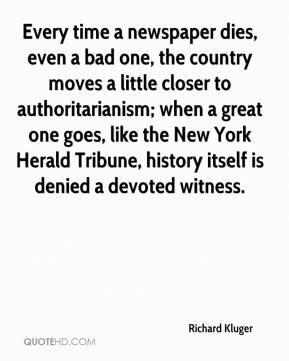 Every time a newspaper dies, even a bad one, the country moves a little closer to authoritarianism; when a great one goes, like the New York Herald Tribune, history itself is denied a devoted witness. 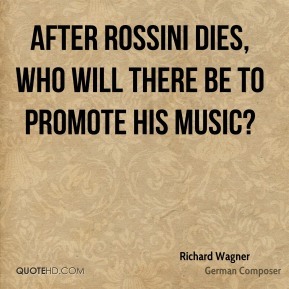 After Rossini dies, who will there be to promote his music?